BUENOS AIRES, Oct 19 2010 (IPS) - They left behind months or years of slaving away — in some cases, literally — in garment sweatshops, working long hours for little to no pay. But breaking free from modern-day slavery or forced labour wasn’t enough for a group of textile workers from Argentina and Thailand, who have gone on to forge a new kind of cooperation reaching halfway across the globe. The Mundo Alameda cooperative from Argentina and Dignity Returns from Thailand, created by women textile workers who used to work in near-slavery conditions, teamed up in 2009 to launch the No Chains brand in June this year. In Argentina there is a hidden but persistent garment sweatshop industry where mainly undocumented immigrants from neighbouring Bolivia work as modern-day slaves. And in Thailand, “there are cases of labour exploitation and unfair treatment everywhere,” the head of Dignity Returns, Boosaba Meechai, told IPS in Bangkok. With designs selected in an international contest, the members of the two cooperatives are producing T-shirts, handbags and caps that they sell over the internet, in fairs, markets and some shops, as they wait for opportunities to expand production to other kinds of garments. Four months after the launch of the trademark, although sales have not taken off as the women had hoped, “many people have got to know Dignity Returns” and No Chains, Boosaba said. Dignity Returns was founded by women who worked for a Bed Bath & Beyond factory in Bangkok, where they were often forced to work up to 60 hours at a stretch, making clothes for international brands like Nike, Gap or Reebok. They were given amphetamines so they could work multiple shifts, and their pay was sometimes docked if they complained of exhaustion. In the end, they were laid off without pay when the U.S.-based retail chain closed the factory in 2002. In 2009, they met members of Mundo Alameda, a cooperative founded in Buenos Aires by undocumented Bolivian immigrants who escaped slave labour in garment industry sweatshops, and local workers. Mundo Alameda first emerged as a soup kitchen in 2001, during Argentina’s severe economic crisis. In the sweatshops where they worked before creating the cooperative, the workers spent long days toiling without rest to produce clothing for top international brands like Puma, Bensimon or Kosiuko. They were crowded into workshops where they also lived, in many cases with their families, had no documents or money, and were rarely allowed to leave the premises. Members of the two cooperatives met in Hong Kong, at a meeting organised by the Asia Monitor Resource Centre, an NGO specialising in labour issues. Communicating with the help of an interpreter, they decided to join forces to raise awareness about slave labour. In Argentina, No Chains products are sold at alternative markets that operate in factories reopened by workers after the owners declared bankruptcy in the 2001-2003 crisis, as well as in the Mundo Alameda shop and a few other stores. But like Boosaba, Cruz says commercial success is not the main point. “The message we want to get out there is that you don’t need bosses to work, when you have an organisation, a cooperative,” she said. “We seek direct contact with clients, because it is important for consumers to know that brand names shouldn’t matter, if the capitalist owners keep the profits and exploit the workers,” she added. The members of Mundo Alameda make a living off of what the cooperative produces, although they have not been able to ensure a steady income yet. But they are not lacking in interested buyers. “Sometimes big clients come, because they know the quality of what we make, and offer to buy 4,000 or 6,000 pieces, but for just a few cents each. But to earn anything with that arrangement, we would have to work much longer than eight hours a day,” she said. However, other clients who accepted their conditions and the resultant smaller profit margin have managed to establish competitive brands in the market over time. They plan, though, to build a network with labour organisations in other countries like Cambodia, Indonesia and the Philippines. “Labour issues are a common concern in these countries,” she said. “Most of the programme’s participants, between the ages of 18 and 50, are workers who have encountered injustice and unfair treatment from their employers. Some are involved in labour disputes” in the courts, Boosaba said. In Argentina, No Chains is only producing T-shirts for now. 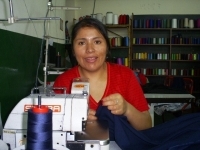 “We want other cooperatives to join together with us, so we can start making jeans, uniforms, purses or caps,” she added. With that aim, they are making contacts, “setting up a network with other organisations from the provinces, which operate the same way we do, and urging them to join in,” Cruz said. * Marwaan Macan-Markar in Bangkok contributed to this article.